Tomorrow (Wednesday, March 4th, 2015) the Kentucky Senate will vote on HB168. House Bill 168 will redefine the requirements for owning an alcohol distributor in the state of Kentucky. The Kentucky house approved it last week. The Senate’s vote is the last step before the Governor signing the bill into law. In brief, a distributor is a company that buys beer from the brewery, stores it and employs sales people to convince retailers to sell the beer. Distributors form a part of the 3-tier system. For a full background on the 3-Tier system please see my series from 2013 beginning with my introduction. Two extremely different companies are very upset about this legislation. I’d like to help clear the air and share my opinion on the situation. The two companies are AB-InBev and Rhinegeist, the elephant in the room and the mouse the elephant is afraid of. AB-InBev owns a distributor in Louisville and last year they bought a distributor in Owensboro. The purchase of that distributor in Owensboro is what set all this off. Currently, any brewery in Kentucky is unable to own a distributor in Kentucky, but out of state breweries can. [footnote] Thanks to Ryan Phillips for clearing that up for me[/footnote]That is exactly what this law is going to change. Anyone who owns a brewery will be unable to own a distributor in Kentucky, which is where Rhinegeist comes in. Rhinegeist has used Ohio’s laws that allow a brewery to self-distribute their beer to do exactly that. Yes, self-distribution laws are a relaxing breaking of the 3-tier system, turning it into a 2-tier system. The way people argue for self-distribution is that Rhinegeist can only self-distribute Rhinegeist. When Rhinegeist decided to expand to Kentucky they couldn’t find a distributor “with the right craft-focus and a small enough portfolio to ensure our mindshare.” to quote Rhinegeist owner’s Bryant Goulding and Bob Bonder’s op-ed in The Courier-Journal. As a result, they decided to open Riverghost Distributing to carry Rhinegeist products and other breweries products, in the state of Kentucky. Now we see why Rhinegeist is siding with AB-InBev. Both AB-InBev and Rhinegeist will have to sell, or close, their distributors in the state of Kentucky if this law passes. The good thing from my point of view. It’s a bad thing for the owners of Rhinegeist because this means someone else gets a cut of their profit. As it stands now Rhinegeist makes more per beer sold than MadTree does[footnote]MadTree is distributed in Ohio by Cavalier & Kentucky by Beer House[/footnote]. Rhinegeist also pays a number of sales people and delivery drivers. Plus they maintain a fleet of vans to enable them to self-distribute. Most breweries have distributors take care of that overhead. So, Rhinegeist losing Riverghost will mean lower profits per beer in Kentucky for the folks at the top. The same on all that goes for the AB-InBev owned distributors as well. This is a good thing for everyone except these two companies. If Riverghost starts carrying other brands and there comes a day where one store only has one spot available on the shelf, who gets that spot? I have an extremely hard time believing that that spot will be fairly assigned to the product most sought after in that market. That spot will be assigned to Budweiser or Truth. My biggest problem is that this is a slippery slope that could lead to decreased competition and eventual vertical integration. If a distributor or store is owned by a brewery there is far less reason for that distributor or store to care about other breweries products. Same goes for a distributor owning a store or bar. Why should they push someone else’s product when the folks at the top can make more money pushing the products of the brewery they own? Part of what has allowed craft beer to explode is the separation of the 3 tiers. Sure, it’s not great but it’s the best we got for now and getting read of, or blurring the lines between, the tiers is not going to help anything. One of the reasons England’s craft beer explosion has been more muted than ours is because of tied houses, where a brewery owns a bar. As I said before, when one tier owns another it lowers the competition. The tied houses in England only serve the beer of the brewery that owns them, unless customer demand for other products reaches an extreme point. Both AB-InBev and Rhinegeist have said that the passage of this bill will cost jobs. That’s only true if AB-InBev and Rhinegeist decide to shut down their distribution companies. They’ve both proven that there is a strong need for these distribution companies to exist. They’re both savvy businesses as well. They’re not just going to dump all the money they’ve invested in this. No jobs will be lost. The only thing that will change is who is at the top of these 3 distributors and that the 3-tier system will be more reinforced in the state of Kentucky. I was honestly slightly excited when I first heard about this beer. 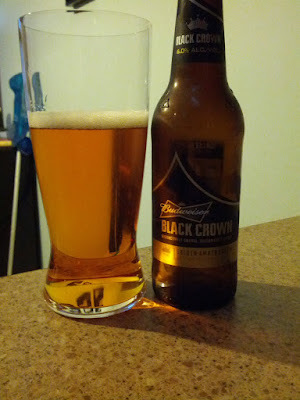 I dig red/amber ales and lagers which is, more or less, what Black Crown is. I also partially hoped that Budweiser may do a decent enough job of making a high quality beer. Then I saw it was only sold in 6-packs and I was unwilling to commit to that. Then all those stupid voodoo super bowl commercials came out and my excitement began to wane significantly. Last week I was doing my normal beer shopping and stumbled upon this in a pick 6 area and figured, eh why the hell not. With a blend of two-row caramel malt and four types of domestic hops, Budweiser Black Crown is finished on a bed of Beechwood chips for a smooth, balanced taste. Incorporating the proprietary yeast directly descended from the original Budweiser yeast strain used by Adolphus Busch in 1876, Budweiser Black Crown retains the key characteristics of Budweiser with its clean taste and high drinkability. Featuring more body, color and hop character than the flagship lager, it also has a slightly higher alcohol content at 6% ABV. The appearance is a tad lighter than I expected but does look promising. It’s got a nice orange/red hue topped with a thickish skim of off-white foam. Very clean smell of grain with… little else. Little bit of biscuit malt, minimal amount of hops, and a minuscule taste of alcohol. Like all things Budweiser this is as unoffensive as possible. How do you make an unoffensive beer you ask? By reducing everything possible to a barely noticeable level. Don’t like hop bitterness? There isn’t any! Don’t like chocolate malts? we got rid of as much malt as we could! So this isn’t really a “bad” beer but it sure isn’t a good beer. Is this better than Bud or Bud light? For sure and without a doubt, though I will probably never have it again. I’ve been slacking on posting reviews for some reason or another so here are 2 reviews I wrote over the past few days. I’ve finished my latest bout of stout/porter action with the strongest 2 of the bunch. Bourbon County Brand Stout (BCBS) comes in at 15% and Blackout comes in at 9%. Both are very well reviewed on rate beer and beer advocate, BCBS is also highly sought after in online trading. Blackout is available at any better beer seller while BCBS is too strong to sell in Ohio and rare enough that you have to ask someone at the Party Source to get it for you from a back room.